I woke up from a vivid dream turned detailed daydream about me being back in Salt Lake City, Utah with my friends. I laid in my bed for probably half of an hour imagining scenes where I see my friends and family in familiar places again. 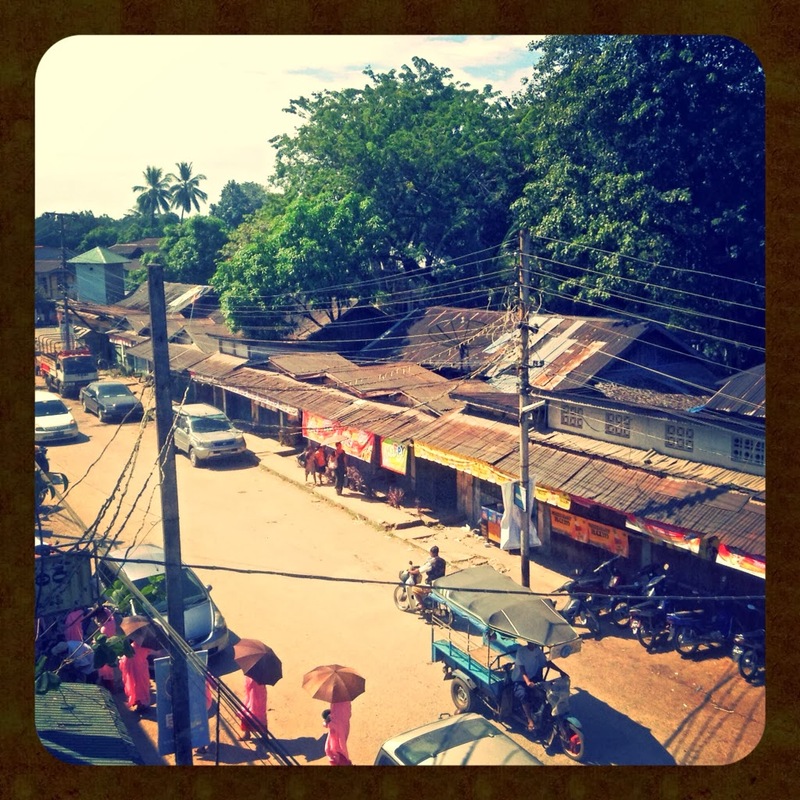 Eventually I walked out of my dark closet sized room that I’m renting for 6 dollars a night in small-town Myanmar. A room so small the door doesn’t even open halfway before hitting the corner of the bed; a bed that my toes dangle off of on account of me being too tall for it. 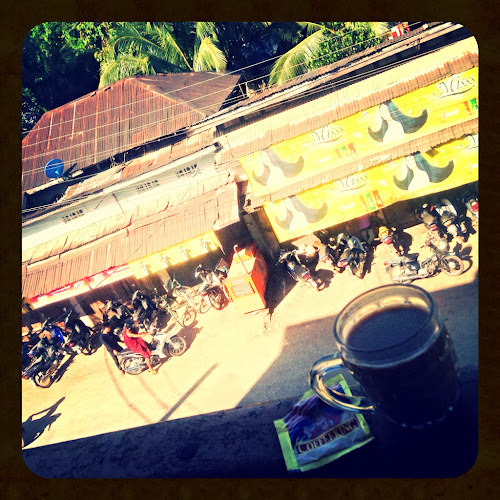 I poured myself some hot water on top of my 3-in-1 CoffeeMix, a coffee substitute that is insanely popular all throughout Myanmar, and I sat on the balcony overlooking the street. I had just time-warped out of Salt Lake City via my closet room and suddenly reappeared in Hpa-an; a Burmese town where it is common place for monks dressed in deep red robes to ride motorbikes and women with root paste on their cheeks to carry woven trays of watermelon slices on their heads while smoking cigars. The contrast was so startling that it compelled me to get out my keyboard and write about it here and now. With thoughts of my friends and family back in the US so fresh in my mind, I can’t help but wonder what they would think of all of this, seeing me, or themselves in a town lost in time. To read this blog and view my photos is one thing, but to be here is entirely another. 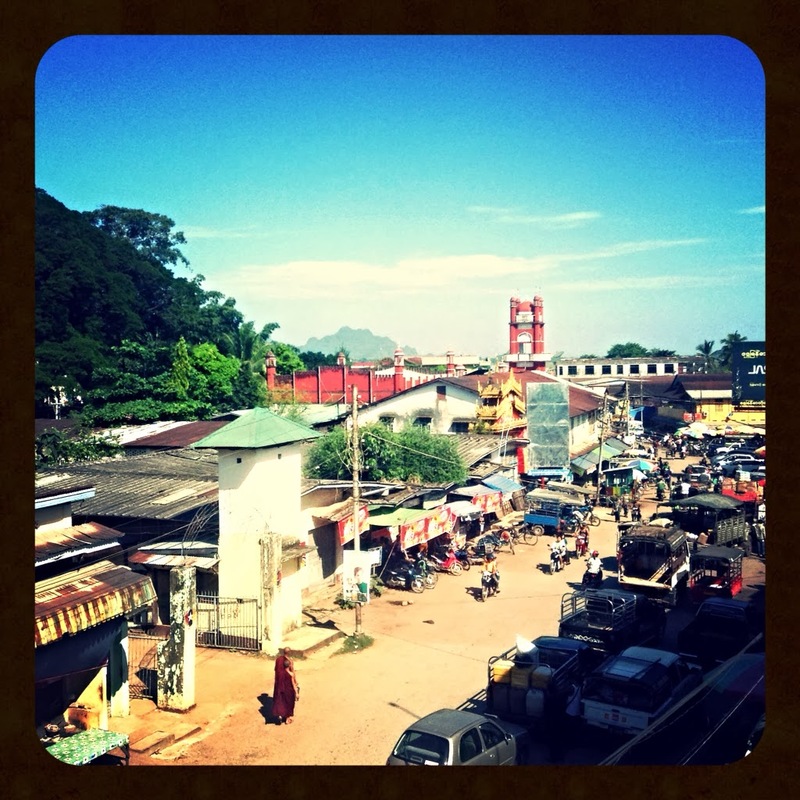 The panoramic view of tin rooftops, golden temples, trees, mountains and a distant lake; the sounds of the market chatter, motorbike horns and loudspeakers chanting in Burmese; the smells, familiar now but still unknown, a strange mix of sweet, foul, and fresh; and the bead of sweat currently dripping down my thigh from the humid heat. These can only be described in words, and words are unfortunately not the reality. Pictures come closer to getting you there, but there will always be that disconnect. I know that many people might take this as bragging, however, this doesn’t actually make me feel superior to anyone. I spent half an hour daydreaming about my hometown for a reason. I miss it, I long for it, and I realize that family and having a place to belong is a very beautiful thing. So what is this post about then? Importance of home? Inspiration for others to experience more of life? If that’s what you want to take away from this, please do. My reason to write in this moment is the change I’ve noticed. A deep yet subtle change within myself that travel has caused for me. I cannot place it, I cannot coherently put it into words, but it is there. In this moment, the change is why I wish to explain the contrast of home and here. A person cannot walk through such different worlds without it changing them a little. This is a funny little fact about travel. Whatever it is that I am doing, I’m enjoying it. I am proud of the things I’ve seen, I am happy for that little change inside of me. Whether that change means anything significant, or if any of this has any real purpose, I don’t know. But I do understand that change is the flow of life. I am living, experiencing all sorts of contrasts and angles that life has to offer. I am currently happy because I cannot say that I am wasting my experience of consciousness. I’ve found a great love for my views of trucks over piled with boxes, produce, and people; of men and women wearing colorful traditional clothing and hats, powerlines in knotted messes, rickshaws that look as if they’ve come from the 1920’s, babies riding on the front of motorbikes, clothes hang-drying on lines in the sun, old women cutting down bamboo stalks with machetes, and women monks in pink robes walking the streets with silver bowls collecting alms. There is a simplicity here that I crave in life, and it brings me happiness knowing with my eyes that it exists in the world. But I’ve also gained a greater respect and appreciation for a home. Friends to call up, family that knows you like no one else, real coffee, familiar roads, a familiar bed, comforts from childhood, a language you know and understand, and a place to belong and build a life around. So, do I stay or do I go? Life is not about choosing one or the other, it’s not about which experience is best, it’s all life. But I would like to advise everyone to try travel at least once. Let it broaden your perspective, teach you what you truly appreciate in life, and let yourself embrace that flowing blood of life for a moment and let it change you. Because it is all life, why not experience as much of it as possible? Letting go is inevitable, experiencing something new is inevitable, change is inevitable, and travel helps you understand that. It teaches you to handle it, and if you embrace it, you can learn to really love that unstoppable movement. Bravo! I got chills while reading your post. In the early morning of some day in July, 2006 I did the EXACT same thing. I just thought about home. It seemed so warm and sweet. The feeling of carpet under my feet. CARPET! SOMETHING SOO SIMPLE AND YET I CANNOT FIND IT ANYWHERE ANYMORE! and air conditioning, hot showers, and foods that were missed. And of course the love from family and friends who actually spoke my language. And I let it take me for a half hour and then I open my eyes feeling homesick and start seeing things as if for the first time. The dirt roads, the tropical vegetation, the slow pace of life and lack of cars etc. I have the realization that it would be so easy to just leave. Just go back to where it is comfortable and familiar. No problem! The old life in Utah seems like a dream. And where I am is the reality. I am actually USED to my current surroundings. I am doing it. I am surviving as a foreigner and I am doing something special and unique and I am connecting with a people that is special and unique that my friends back home do not know and do not understand and will never understand until they have lived here for many months like I have. Sorry! I started ranting about myself. I could go on but I won’t. Suffice it to say that while your experience is unique and different from mine, I DO understand the complex emotions that can be felt after leaving the country for awhile. It is more than moving to a different location. It is like moving to an alternate reality because so much that is normal there is completely unknown or doesn’t exist back home! And it is SO fascinating! I really liked this post Sarah and you are absolutely 100% correct that people can’t truly comprehend what you are writing about until they have done the same thing. I hope you stay out there awhile longer so we can visit you! 🙂 Those experiences are priceless and help you….draw closer to your fellow (wo)man….. and ……. help you become enlightened because you now have a clearer picture of what it means to be human through the lens of your multiple perspectives.